These are a big hit, especially for all the book lovers the Crafty Daughter knows. Book letters are $12 each, and we will ship them anywhere in the US. Inventory varies by books we have on hand. We do have a number of books already made up. 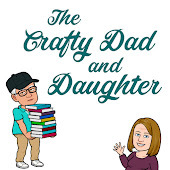 You can use the contact form on the left of the page to make an order, or feel free to message me through The Crafty Dad and Daughter page on Facebook.